20, of Sommerville, Maine; assigned to 133rd Engineer Battalion, Maine Army National Guard, Portland, Maine; killed Dec. 21 when his base dining facility was attacked in Mosul, Iraq. 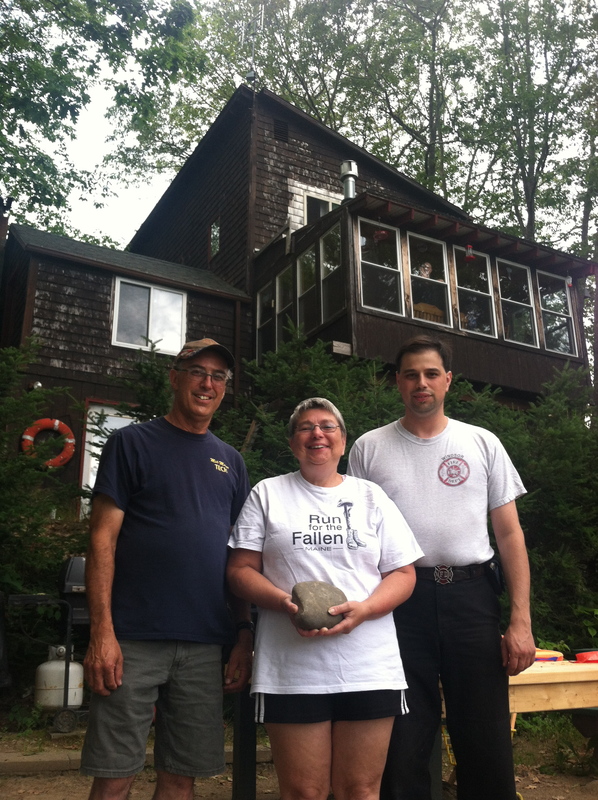 To honor SFC Thomas J. Dostie, his mother, Peggy Dostie retrieved this stone from their one-of-a-kind home in Somerville, ME. More at this link. MHANF. I didn’t know Thomas J. Dostie, nor had I heard of this young man before 23 May, 2014. However, my climb to the summit of Owl Mountain the day after would make his name unforgettable. My name is AJ Scotti and I currently live inside the diverse city of Long Beach, CA. In October of 2013, one of my dear friends, Major David Cote, asked me to be a part of an incredible project executed on Memorial Day weekend-2014, where individuals would remember fallen Marines, Soldiers, Sailors and Airmen by carrying stones inscribed with their names to the summit of a mountain. The weather the morning of the hike was perfect. I arrived at the gathering point at 0434 along with another fellow hiker and within minutes David was greeting me. We embraced, quickly exchanged brotherly salutations, and then centered ourselves to our cause. He briefed me that due to patches of snow and ice on the main trail to Katahdin summit, we would be shifting to a new summit. Dave then explained that my mission was to carry Army Sgt. Thomas J. Dostie’s memorial rock up to the summit of Owl Mountain. He placed Thomas’ stone in my hand and I observed that it was a small. Thomas’ stone was a black-white & brown speckled igneous rock that had his initials, rank, service and year of birth & death etched into it. I looked at Dave and thanked him for giving me the opportunity to carry his stone. He smiled and then as he always does, reciprocated my gratitude by thanking me. The trek started off by getting to know my fellow hikers, but eventually evolved into our primary mission; to bring our stones up to the top of the mountain to pay tribute to fallen service members of Maine. Ironically, the trail up to the summit was littered with stones, rocks and boulders that our team had to navigate both through and around. I observed that I passed many stones that were similar to the one I was carrying in my daypack, but then I quickly drifted to thinking that Thomas’ stone was different. It was intrinsically tied to his mother and father, his brother, his fellow warriors and friends, and to the tens of hundreds of supporters that made this summit hike possible. Thomas’ mother Peggy personally found this stone on their family’s property. I thought about the energy it took to find it, polish it, personalize it and stage it for this hike. I reflected on how much he is loved and how much he is thought of each and every day. He could never be forgotten. During our adventure I made friends with a young man that struggled in the last couple miles of our team’s arduous climb. The hike was taking a toll on our feet and scrambling up rocks and small boulders was energetically exhausting. I found myself drawn to assisting this young man with any resource I had on my person, to include verbal motivation. I sensed that Thomas would have done the same thing and it made my hike all the more enjoyable. At the summit, I set my backpack aside from the rest of our team to give my mind time to regroup. I silently paid homage to this young man, thanking him for his unselfish contribution to his community, to his fellow warriors, to his mother, father and brother, to the State of Maine, and to his country. As our team reflected on each fallen warrior’s rock I realized that through their death they catalyzed a group of individuals, who had never met before, to unite and celebrate not only their lives, but life in general. Before I put Thomas’ rock in my pack I thanked him one more time. While our team was regrouping to descend down the mountain, I met a gentleman named Peter, who personally knew and served with Thomas Dostie in the 133rd Engineer Battalion, Maine Army National Guard. He portrayed an image of him that will never escape my mind. Apparently, Thomas loved to tinker as much as he loved to help others. To protect his comrades from improvised explosive devices that were placed on the roads by local insurgents, he would retrofit large metal panels cut from the hulk of damaged tanks and armored personnel carriers onto less protective mobile vehicles. He would execute this endeavor during the time he could have been either sleeping or eating. Peter said that this action directly saved many lives in his battalion. I could tell that Thomas had a special place in Peter’s heart. Our team’s travel back to our original point of departure was more solemn. You could tell that our group was emotionally affected. I was affected. When we arrived at our campground Dave told us that we would personally speak to the parents and loved ones of the fallen. This situation caught me off guard and made me feel uneasy. I had thought that my mission was mostly a physical execution versus a mental one. However, my introduction to Thomas’ loved ones had the opposite effect. Meeting Thomas’ mother Peggy, his father Mike and his brother Tim solidified a deeper understanding of who he was and what he stood for. I felt honored to carry his rock up to the summit of Owl Mountain. I felt privileged for knowing about Thomas J. Dostie from Somerville, Maine. Thomas, you gave your life unselfishly. You will never be forgotten. I will never forget you. Great Story of thomas ,I did not know him but,know the family,Great family. Just wanted to let you know that I was honored and humbled to have carried Thomas’ stone on a charity hike on Saturday October 18th 2014….For the past 3 years myself and any of my friends who are able and available do a 20 mile walk for the charity of our choice….Gives us a reason to make sure we get together at least once a year in our otherwise busy lives…This year I chose “The Summitt Project” as my charity….And in doing so we also decided to each carry a soldiers stone in our pack for our 15 plus mile hike…While going through the stones trying to pick one to carry Thomas’ picture grabbed me as he looks so kind and so young……When I saw his name I knew he was my guy (both my Dad(1985) and my brother(2011) were named Thomas…..9 of us girls all carried our stones with pride, we made many stops along the way, took pictures and talked about the sacrifices made by young men and women like Thomas, that allow us the freedom to take these beautiful fall hikes we all enjoy so much…..We started our hike at my house on the Elmwood Road in Pownal, each of us read the cards with our stones and talked about our guys….Thomas had a beautiful walk through the trails in Pownal in and around Bradbury Mountain State Park, to the summit and back down.. On to more walking trails, then on the road to Freeport eventually landing at Gritty’s Brew pub for some much needed beverages and food…Thomas will always be a friend of mine now…. “The Summitt Project” is such a wonderful way to keep these memories alive for you and all the other families and loved ones…Thank You .. I am writing to you today to tell you what an honor it was to be able to carry your son Thomas’s stone up to the peak of Cadillac Mountain on October 4, 2014. It was definitely an eye-opening experience, being that the weather was absolutely atrocious. Slippery rocks, fogged up glasses, and the extreme winds. I found myself feeling pain and coldness along the hike, and when I thought of that, I kicked the thought right out of my mind. This was not about me. This was about honoring Thomas, about honoring you, the Dostie Family. I am so thankful for The Summit Project, because without them, I would not have been able to learn about Thomas, not even know who he really WAS. He was a very caring young man, never left anybody unloved. He was a volunteer fire fighter, and loved the outdoors. He loved fishing, soccer, wrestling, and most of all, he loved just being out on his boat. I truly believe that it would have been a pleasure to meet this man. After the Cadillac hike, I’ve had a totally different aspect on who Thomas was. I had only heard his name before. Now I feel as if I am connected to him, and I can never forget that. I am extremely proud to have carried Thomas’s stone up Cadillac, and I never forgot about him throughout that hike. I am very grateful for being able to learn about your son and brother Thomas Dostie. I thank you for letting me carry his stone. Maine heroes are never forgotten. What a wonderful and heart felt post. Thank you! I was privileged to spend the afternoon with you and remember Thomas through your stories and personal accounts. I truly know who he was after this weekend. As I said yesterday, when I returned his stone to you, Thomas certainly must have been a reflection of his family based on all accounts. The stories of his humor, antics, and clever mind are mirrored in the interactions I witnessed among all of you. I thank you for taking the time to share your stories. As you know, yesterday I had the honor of carrying Thomas’ stone to the summit of The Owl in his memory. I had not climbed The Owl in many years and I had forgotten how stunning its location is. The mountain literally sits in the shadow of Mt Katahdin. The view of Baxter Park and the rest of Maine stretches as far as the eye can see. The hike was generally easy with perfect weather. Near the summit, we had a short scramble over some boulders before reaching the peak. We met at the top of The Owl in a circle with the memorial stones placed carefully in our center. It was a powerful moment to experience, in perhaps the most beautiful location in the State of Maine. When my turn came to speak, I remembered Thomas as a selfless Soldier who placed the needs of his friends over his own. I remembered him as a joker and lover of tricks and I remembered him as a technically gifted and intelligent Soldier. Most importantly, I remembered him as a brother and son from a good Maine family. Thank you for sharing your memories, and be assured that the memory of Thomas goes on after his passing. My name is Catherine Gordon and I had the honor of hiking Thomas’ stone in Baxter State Park on Saturday, June 27th. I was with several other hikers, one of whom knew your son and hiked the trail with me. Three of the hikers went towards Knife’s Edge while Jack and I headed towards the South Turner Trail passing by the beautiful Sandy Stream Pond on the way. We had the trail to ourselves and found the hike to be a strenuous one ending at 3122 feet in elevation but with gorgeous views across to Katahdin where we hoped our friends were making their own accent with success. The reflection of our soldiers lives at the top was a beautiful one and touched me deeply. During the ceremony at the top, I talked about what I had learned about Thomas and then Jack spoke with elegance, grace, and deep emotions about him, sharing personal stories about Thomas, of what a good man he was, and of the day he passed. It was a beautiful sunny day and the summit had a quiet peacefulness about it….like it knew we had a special mission that day and the mountain and nature granted us the perfect moment for our reflection. After our decent, we stopped at the pond and sat on a large rock looking out over the water reflecting on the experience we had at the top, when looking to the right appeared a deer and to the left a moose… thankfulness washed over me that I was here to appreciate the beauty of the day and yet sadness that others had passed too soon. I hope that I can live a life worthy of your son’s sacrifice. I may have only carried your son’s stone for a day, but I will carry his story in my heart forever. Maine heroes are not forgotten. I am writing to you today to let you know how honored I felt to carry your sons stone this morning at the Aaron Henderson 5k memorial run in Houlton, Maine. I am a Customs and Border Protection officer stationed at the Houlton Maine Port of Entry since 2005. I first heard of this run months ago and I instantly felt compelled to sign up. At that point I had never ran a 5k or for that matter ran at all since my academy training. I am a huge supporter of the Wounded Warrior Project and was glad to see that the run was honoring a fallen local soldier. My oldest stepson Nate who is 16 wants to join the military when he graduates and he ran the race with me along with my other stepson Sam. Many people spoke in memory of Aaron Henderson right before the race and when I found out that people could carry a stone of a fallen Maine soldier I felt completely honored and humbled to do so. I have the utmost respect for your son who gave the bravest sacrifice a person can give for our great Country… especially at such a very young age. My deepest condolences to all of you that you lost him so early in his life, my heart aches just thinking about how terrible a loss you feel… but I want you to know today that even in his death he continues to inspire others as he was very inspirational to me today as I ran the woods course. I talked to your son throughout the whole course, thanking him for the ultimate sacrifice he made and telling him how honored I felt to carry him with me during the race. I have really just recently started to try to get into shape again so there were many times that I wanted to stop but everytime I even thought about stopping I looked down at the stone and felt Thomas with me and his spirit kept me going. At the one point that I wanted to give up and walk, a runner happened to pass me carrying the American flag and I heard “Just follow that flag” and that kept me going the rest of the race. As the sun had barely risen on October 17, 2015, it was my honor to pick up the stone of Tommy Dostie from a white table inside a white tent at Thompson Island rest area. I put that stone in my hands not having a chance to meet you, his family, or to learn about who Tommy was. It was one simple question of “Who was Tommy Dostie?” that I immediately tried to answer. I searched his name online, and instantly understood the true impact of the legacy of that stone I held. I wanted to share his story the best I could, so I read on…and on. I quickly found so many articles referencing the incident at the chow hall, and so many positive comments about this young man who had barely entered adulthood. Knowing I not only had in my pack a stone representing a soldier’s life- but a firefighter’s life, was truly powerful. Having the personal connection of knowing the fire service and the type of people who dedicate their lives to serving others, it was no surprise to me that people loved him like they did. To imagine the emotional impact of not only losing a son, a friend, and a brother is devastating, and to know that young man died so close to a holiday that should be filled with joy, happiness, and giving, is all the more so. To read the newspaper accounts from those members of the 133rd that were there the day of the horrific attack is like reading something made for a movie. To know Tommy was not only among his crew, the individuals who swore to serve this nation no matter the cost, but he was there with some of the friends from home who were like family to him certainly makes it heavier and yet lighter in some way. It is my hope that through our work with TSP, we can continue to share Tommy’s story, and to share the sweet and happy memories of who he was as a boy, and then a man. That terrible December day will never be forgotten, and neither will the day that I made it to the summit of Cadillac Mountain with the stone representing his life. The life that began on February 25th…which also happens to be my own birthday. It’s funny how things are just meant to be, call it fate, destiny, what have you, but from the stories I’ve read about this kid and his “need for speed”, his energy to run into burning buildings others were running from, his ability to make people laugh, his willingness to help anyone that needed a hand, and most importantly, his love for family and his country- I have no doubt that he and I would have been fast friends. Instead, I can now carry his story with me daily and help others to understand what it truly means to be “An American Soldier”. Thank you for your service, Spc. Dostie. For your service and your story. Maine thanks you. I thank you. And I vow that like other Maine heroes, you will never be forgotten. Rest easy, soldier. I am writing to you today to tell you what an honor it was to be able to carry SGT Thomas Dostie’s stone in The Summit Project March in Newport April 16, 2016. , I learned about Thomas with some of the men from the 133rd Army National Guard, learned he was a volunteer fire fighter, that he loved the outdoors. He loved fishing, and , he loved being out on his boat going fast ,that he liked everything about small engines, he was a go to guy when you need things done ,always willing to help at home and in the service, he loved his family ,he talked about them often. I truly believe that it would have been a pleasure to meet this young man. . I am extremely proud to have carried Thomas’s stone , and I’ll never forget about him . I am very grateful for being able to learn the life and legacy of SGT. Thomas Dostie.. Maine Heroes Are Never Forgotten. As I sit here gathering my thoughts I was reminded of the compassion and dedication that Thomas expressed in his life. I so enjoyed sitting down with your family Saturday night and hearing the many stories of Thomas and the love that was so prevalent in your eyes and faces. I’m still chuckling in side as I think about Mike telling me about Thomas’s driving ability’s and his run in with the radar gun. The stories of him and his brother with the transmission in the mower is a classic! I so much appreciate the opportunity to get know Thomas more through you. As I was getting ready Sunday for our hike I started to think about the many missions which we did while we were in Iraq. How we would double check our gear, check our route, weather and especially our equipment. I remembered Glendon Bowers telling me how Thomas loved his truck and everyone else loved it too because it was the fastest in the fleet! How Thomas would spend hours tuning that motor until it just sang. I met up with the other members of Team Blue and we headed for the drop off point at Katahdin Stream Camp Ground. As we climbed toward the summit of Owl we would stop every now and then to rest and have a snack. I would take Thomas and Tyler out of my ruck and joke about how they were poking me to get lose and go. How as a boy Thomas couldn’t wait to get out of school get into his boat and ram around the pond. This gave me great joy and reminded me of my son and his love for the outdoors. As we broke the tree line the climb got harder. Our packs seemed heavier and my mind started thinking about the burden that your family carry’s for your loss of Thomas. How we as TSP participants must strive to never forget our Maine Fallen Hero’s and the sacrifice that our Gold Star Families have endured. As we got to the top and placed our stones in a circle we told each other our stories it seem to lift some of the burden from my pack. I hope through this you know that Thomas will never be forgotten and that it takes some of your burden away from life’s backpack. Again thank you for allowing me to become a small part of your family through the life of Thomas. P.S. I didn’t save your email address Mike and if you would like those picture’s here is mine. Bmilitia92@yahoo.com send me a note and I would gladly send them to you. I would like to thank you all for the honor of carrying Tommy’s stone on Saturday October 1st, 2016 to the Summit of Cadillac Mountain. I however, do not feel like there are enough words to express my gratitude and sentiment for your son’s sacrifices as part of the 133rd. I arrived to base camp later on Friday due to having to come from work, and the sight of the tent all set up in the field just took my breath away – the glow was something I had not seen before, almost like every spirit was waiting. I unpacked, talked with my friends a bit, and then went down to see the sights. I was thankful for the hugs and friends who were there getting things completed before the morning, and slowly rounded the table with all the stones, placed ever so carefully by the TSP crew. I found Toms stone immediately and just placed my hand on it with a smile. Saturday morning was busy greeting everyone at base camp that I had met previously and new TSP family as well, and after the brief grabbing Toms stone and placing him carefully in my pack alongside the Sacrifice stone – how fitting – because this is what it is about – his ultimate sacrifice for not just myself, but every American citizen. As we left the insertion point for Team Bubble, the nerves and concentration soon turned to team building – as we had a hiker with an injury fairly soon after stepping off. I immediately reminisced about a story of how Tom had taken a young man under his wing and the time and attention he paid to this boy, about how he loved to tinker and his mechanic skills. I had read the previous hikers stories of how some of the tinkering he did certainly saved lives in Iraq. I thought about how his caring nature was instilled by the love you two provided to all the children who came through your doors, and how he would have wanted us to carry this hiker through to the summit. From that point on, I hung back to ensure she was not left behind. The climb was challenging – lots of rocky points, physically challenging, but breathtaking views of the ocean and towns below. We paused a few times to discuss the heroes we carried, how their lives were lost and the impressions they made on us all. Everyone’s stone and story was so different, however, the emotion and feel was the same. We were all so grateful to participate and honor them. Summit Ceremony was cold, the wind so fierce, and quite emotional. However, amazingly enough, it did not seem to bother any of us. We carried out our mission swiftly, and ended with 22 pushups to honor and be aware. The bus ride back was somber, but with an air of happiness as though the memories we shared somehow solidified the comradery felt along the trail. Completing the day with the circle ceremony, and finally being able to meet you all was the highlight of the afternoon. I so enjoyed talking with you, sharing about each other’s lives and realizing just how I very easily could envision Tom today – with a smile on his face perpetually like his father and brother – a shyness that could surface like his niece, and a heart so big and made of gold like his mother. His story will never be forgotten, his sacrifice always remembered, and his memory perpetuated forever. Stone in the warrior project organization. I carried the stone next to my friends who carried similar stones but with very different stories. I decided to Carry the stone in my hands so I could study it and feel it get heavier as I got further in the journey down the road. When we arrived at our destination I told of Mr. Dosties story. This was an amazing experience and I hope to do it again sometime. Dear Dostie Family, Peggy, Mike and Tim. I first would like to thank you for the amazing honor of being able to honor such an amazing man. I had the honor of carrying Tommy over the weekend which i will will never forget and will hold as a true honor for the rest of my life. I will be honest when i first arrived i wasn’t expecting what was to come. I didn’t expect the massive amount support that there was. I hadn’t experienced something like that before and it was a hard adjustment to overcome. When we first met i wasn’t really sure what to say. However as the weekend went on i started to adjust to everything that was around me. i felt honor i felt happiness and a certain level of peace that i hadn’t experienced before. Carrying your son Tommy over the weekend really taught me alot. It taught me that your never alone and if you need help there will always be a hand. I had the pleasure of talking to you guys after the hike around the fire and really enjoyed hearing all the stories about Tommy and seeing how much alike we really are. I wish i could have met him in person, i think we would have gotten along great. non the less you raised two amazing sons. I will never forget my experience and will never forget Tommy. he was truly a hero and i will hold his memory in my heart forever. I want to thank you for an experience i will never forget and i am excited to continue supporting the summit project and all the fallen hero’s. Tommy will not be forgotten. I am also looking forward to seeing you all at Acadia in October. Stay happy and i’ll see you all soon. I didn’t get the chance to meet Tommy. I know a lot of folks from the 133rd but never got to meet him. I carried his stone on our motorcycle for this year’s (2017) convoy from Portland to Millinocket. It was heartwarming and an honor to hear the stories from his childhood. The family is kind, loving, and caring. Tommy sounds like a fun and energetic young man. I look forward to seeing them again. Thank you for the honor and for you and your son’s service. “Tommy had a big heart.” Those were the first words out of my mouth when it came my turn to talk about him at the Summit Project Hike in Portland, Maine on September 11, 2017. I came to that conclusion after reading the different postings describing how Tommy was there for his friends during hard times, how he was a volunteer firefighter and brother to many adopted/foster children over the years and how he used his personal time to help outfit the engineering vehicles (in Iraq) so that they were safer. A gentleman came up to me after the talk and added more detail on the 133 Engineering Battalion. He said they would cut pieces of metal from other vehicles (no longer operating), shoot at the metal to make sure they would withstand the bullets, then place the metal in the engineering trucks to make them safer for the occupants. He also said that members of the 133rd took it upon themselves to set up mini medical stations around the base and assign emergency duties to everyone in the event something should happen. I don’t think anyone could have foreseen the tragedy that would unfold, but their advance preparedness helped stem the losses of that day. To me, Tommy subscribed to the Work Hard/Play Hard credo. He was there for his friends…he was there for his co-workers…he would blaze through town “testing out his vehicle” like one of the boys from Dukes of Hazard (which makes me laugh as my son was the same way). Good times. I speak to you as the mother of a son who served with the 101st Airborne in Iraq (2003), who returned home suffering from PTSD and who also died young. I have the highest respect for you as Gold Star Parents/Brother… for how you raised your son to be such a carefree, fun loving, caring (and missed) individual and for the continued care you demonstrate in your personal lives today. It was wonderful to see the picture of you holding Tommy’s memory stone in front of the house you’ve opened to so many over the years. Very nice. Thank you for being a part of the Summit Project and letting me get to know your son Tommy. It was an honor and a privilege to be able to carry Tommy’s stone. As you know I was deployed with the 133rd in Iraq. Although I didn’t know Tommy personally I have a deep connection with him being that we were deployed with the same unit. I have made it a goal to carry the stones of all my fallen comrades, I am grateful that I had the opportunity to carry Tommy on this hike. I learned a lot about Tommy, he was a very caring and helpful person as a civilian and as a Soldier. He helped make it possible for many of us to make it home and for that there are no words I can express enough. You raised a hell of good young man. My name is Travis Frost and I work for the Hancock County Sheriff Dept. as a K9 patrol deputy. I had the pleasure and honor to carry Army SPC Thomas J. Dostie’s stone. He was honored in a 4 mile Veterans memorial race in Ellsworth. Prior to the race I learned Dostie was very young when his base was under attack. I couldn’t imagine the thoughts he must of felt or dealt with during that time. During this race there was few times where I felt some pain or soreness but kept going knowing that Dostie was challenged with harder situations. I ran next to a friend of mine who was also carrying a stone. We shared with each other the information we knew about our soldiers. It was a honor to carrying him through this race. My K9 Finn ran with me and we both enjoyed this experience. We strongly recommend any and all to participate some how. It was a beautiful weekend to celebrate the lives of our heroes at Baxter state park over this Memorial Day 2018 weekend. I was honored to carry the stone of SGT. Thomas Dostie. It was also a great honor to be able to hand his stone off to his family. Having experienced the summit project before, I knew that I had to prepare more mentally than physically. The task of carrying a backpack up a hill is so much more difficult when the weight is that of the fallen. I had plenty of stories about sergeant Dostie as I made my way up Owl mountain. His mother, father and brother are all passionate story tellers and they shaped his life so very well for me at this event. From what I gathered, Thomas was the guy to see if you wanted a deck torn down (or, just a few boards:) His demise Did not fit his personality. Sergeant Thomas Dostie served our country well and paid the ultimate sacrifice. I could feel the pride and the sadness from his mother and father. I could hear the love in the voice of his brother. The younger members of the Dostie family made my day as we played red light, green light in the lodge as everyone shared stories and laughter filled the room. Its worth so much to me that I had the Opportunity to share a small piece of my time with this family. It is something that I will never forget. SGT Dostie might have lived fast and left too soon but he has one more soul that will share his story for the rest of my days. Sacrifice is lost on some, but all for others. Thank You for your service Thomas. It was and honor to carry Tommy’s story up Cadillac Mountain yesterday. I got to know his story of his life, your families life and how he served. He served as a firefighter and in the 133rd Engineer Battalion out of Portland, US Army National guard. I thank you so much for your ultimate sacrifice serving our nation, our families and the world. As I carried his stone I learned that we are not alone others have paid the ultimate sacrifice and Its important to learn all the stories and carry the burden together. We are stronger together Tommy, Michael and Peggy you will be forever etched in my heart and soul. Together forever we will never forget. I am truly blessed and honored to carry his story today, tomorrow and forever.